Navigating the various efforts that benefit social causes can be a complex nightmare for an organization or individual looking for ethical, effective avenues to contribute to. HBW’s innovative corporate social responsibility (CSR) solution is empowering the firm’s own financial advisors to personally seek out and help the worthiest in their respective communities. Barney Hellenbrand, CEO of HBW Partners, describes how to approach CSR efforts in business. Instead of searching for the perfect organization to support in sharing our good fortune, we went with what we thought would be most effective by asking a dozen of our best advisors to research the areas where they themselves live and work. Americans are the most charitable people in the world(1), with total annual contributions from individuals, estates, foundations and corporations reaching a record high of $390.05 billion in 2016(2). Ironically, a socially conscientious business, looking for ways to make a real contribution, faces its greatest problem in selecting who among the myriad of national organizations and causes, campaigns, charities and humanitarian efforts is most deserving. While considering this as the holidays approached in late 2017, HBW Partners CEO Barney Hellenbrand turned to the people whose judgment he relies on throughout the year, and enlisted the help of 12 of his top financial advisors from around the country in a unique, community-based “pay it forward” program. HBW Partners’ approach to finding a worthy charity is based on the logic of the national broker’s expectation of responsible diligence in finding good causes, by assigning the research of worthy recipients to individual financial advisors who know their own communities—as opposed to just mailing off a check to a well known non-profit organization. Publicity for the broker’s activity would be won by virtue of its being authentically involved in the affected communities, aligning with the 2010 Edelman Goodpurpose Study finding that 67% of consumers were more likely to buy from a company that supports good causes(3), as well as Edelman’s 2017 Earned Brand Study, which reported that fully half of all global consumers said they are belief-driven in their buying preferences(4). It is not a coincidence that this straightforward program eliminates the basic problem of knowing how to avoid less-than-honorable fundraising groups, or outright scams, that manage to spend more on their own expenses than for their charities. Without extensive research, it can be difficult for a donor to tell the difference between two similarly named groups like the Connecticut-based National Veteran Services Fund—who spent nearly 69% of the $8.6 million they raised in FY 2015 on fundraising costs—and Virginia’s National Military Family Association, who spent 82% of their $5.2 million in revenues that same year on its charitable program, but only 13% on fundraising costs(5). 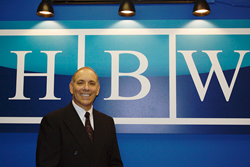 Established in 1991, HBW Partners is a multi-faceted financial services organization offering the resources of a large company, while focusing on the personal touch of a small firm. They partner with honest, caring and motivated individuals who desire the independence to run their own business, while emphasizing long-term relationships that enable their advisors to provide many of the best possible outcomes for their clients. HBW Partners empowers advisors with innovative products and optimal solutions to help their clients at every stage of life; whether it is professionally managed money, packaged products, tax planning, insurance, annuities or trusts. Through partnerships with many significant providers across all aspects of the industry, they have made available state-of-the-art technology such as facial recognition tools, financial planning software, client acquisition programs, and business planning tools to enhance the client experience, manage risk and increase productivity. Their motto is “Character and Quality Above All”. Autonomy, Mastery and Purpose with Trust is the basis for everything they do. For more information visit http://www.hbwpartners.com/. (1) Hill, Catey. “Americans Are the Most Generous People in the World.” MarketWatch, 16 June 2015. (2) Giving USA. Giving USA 2017: Total Charitable Donations Rise to New High of $390.05 Billion. (3) Allen, Frederick E. “The Five Elements of the Best CSR Programs.” Forbes, Forbes Magazine, 9 Aug. 2011. (4) “Earned Brand 2017.” Home, Edelman.com. (5) Giorgianni, Anthony. “Best and Worst Charities for Your Donations.” Consumer Reports.